The younger generation today has quite the knack for getting up to speed with consumer technologies, and where the iPhone is typically a household name, it would be interesting to see what kids have to say about the new Apple Watch – having never come across one, let alone used one. 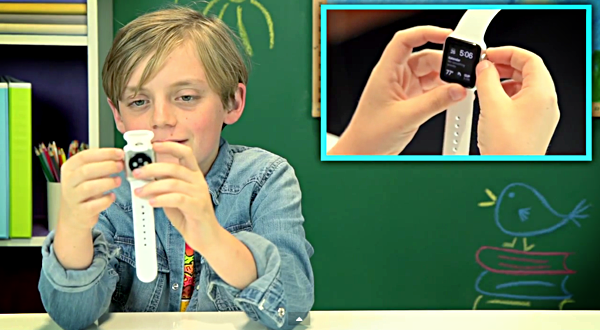 This video on YouTube catches the reactions of kids as they’re shown the actual Apple Watch in the flesh. TheFineBros have become popular since they started rolling out reactionary videos which were typically drawn on a well set formula. Where the SOP has been to show the younger lot something pretty old, and the older generation something new and current, the producers have changed it up a bit this time around, much to some kids’ relief as is evident in the video. While some of the kids thought that receiving calls and text messages on the watch was pointless given that you would have the iPhone right there in your pocket, it was abundantly clear that the kids found this device pretty cool, with a majority of them expressing their desire to buy one. Speaking of buying one, they were told about the gold Apple Watch Edition costing $10,000 and above to which one kid reacted, “This is just as good as the solid gold one”. Interestingly, one of the kids referred to the Apple Watch as an “accessory” to the iPhone, when asked if the watch was going to make some serious inroads and be the hit that Apple intends it to be. Check out the video below and let us know what your views are on the Apple Watch in the comments section! i love his kids can see how stupid it is to tether a 400$ watch to a 800$ phone just so you can wait 2 minutes for it to boot up and die on your after 12 hours. I think the magic here is, instead of wasting 1 battery, you waste 2. and instead of 1 device now you need 2. Would you “beet” on it? Not as efficient as that caterpillar on your upper lip. Now that’s top-notch! asianprince213 — know your meme’s. Good try Winner. You are new at this aren’t you? I Google reverse-searched your avatar months ago, ma’am. Your point?